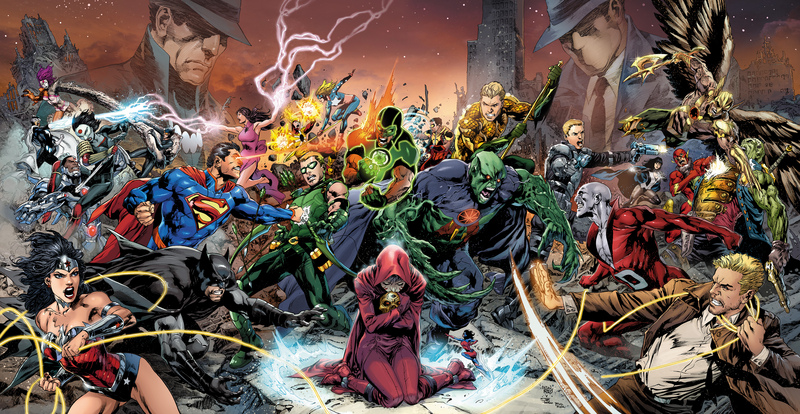 Today we’re filing a brief post to make sure you folks are all aware of the breaking Justice League: Trinity War news! DC All Access has just released the first Trinity War Unboxing video and spoiled a whole bunch of figures from the set! Pride (CHASE!! This would seem to confirm the rumor that the Seven Deadly Sins are in fact the Chases for this set, and why the Trinity of Sin were actually pushed up into The Flash set. Now to get all Zapruder-filmy on you. If you stop the video at approximately 2:40, you get a glimpse of Pride’s Point Value–and there appears to just be one number. If that is true, then that would mean that they won’t have a Possession Mechanic similar to the War of Light Entities, or at the very least that the mechanic would function quite differently. Again, this is SUPPOSITION from a somewhat blurry screenshot (although it appears clearer when you watch it in real time.). Now having said that, the figure base does appear to be a slightly different shade of tan/gold than the actual dial; does this mean it’s a SwitchClix of some sort that will interact with either of the new Resources we’re getting or a separate Team Base (ala the Zombies)? Almost certainly not, but I’m going to start that rumor right now!! Whew!! Okay, so it looks like the DC Trinity (as it were) of Superman (already Previewed), Batman and Wonder Woman are all Super Rares in this set. The Chases still hold a lot of intrigue, especially since it seems that they’ll mirror the 3D Special Objects. Speaking of the Chases–or more specifically, the distribution of the Chases–the brick opened by the host featured a Chase AND a Prime. Will this be typical of the rest of the Bricks? I suspect not, but if it is, that would be a welcome change! So what do you guys think? Does this make you more excited for this set, or less? Even as a Marvel guy, I have to say this Unboxing definitely made me more excited. Feel free to post your immediate reactions in the Comment section below. Stay Safe, and Watch Where You Draw Your Lines of Fire!! I would guess that the Outsider we see here is the chalky Flashpoint version, who was the alternate Alfred Pennyworth. I agree that the non-prime is probably the CS guy. Heh. So are you more excited or less after the Unboxing?